Venturing into the business of microgreens production offers a grower the opportunity to expand existing markets and open new ones. 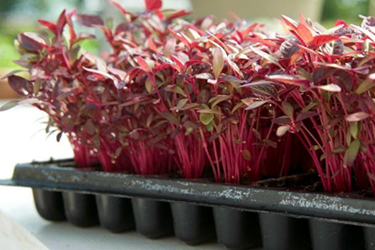 Microgreens varieties can be marketed profitably as individual components or in signature blends, combining different flavors, colors, and textures. They can be quickly produced year-round, even at high latitudes through the depths of winter, with supplemental heat and lighting. In addition to their versatility and potential profitability, microgreens are nutrient-dense, intensely flavorful, and simply beautiful. 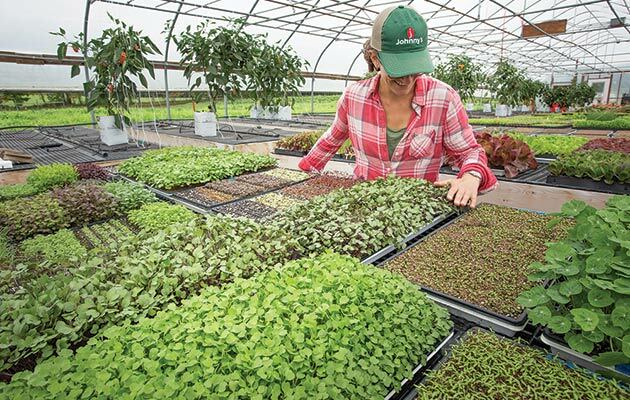 While microgreens are relatively easy and quick to grow, and start-up costs relatively low, commercial success depends on knowing some important points up front. This guide will help you on your way with planning considerations; the basics of sowing, growing, and harvesting; and recommendations for marketing this profitable, year-round specialty crop. Sowing dates can be coordinated to produce a mix of varieties, all ready for harvest at once, at ideal size. You may want to start with a few straightforward varieties, or with a professionally premixed selection of microgreens, then diversify later on. Johnny's currently offers two premixed options: our Mild Micro Mix, a balanced combination of mild brassicas; and our Spicy Micro Mix, a complement of sharper-tasting varieties. Both are precisely formulated to produce a range of colors, flavors, and textures with compatible growth rates. Microgreens have a quick turnaround time, but there are differences in growth rate between different types and varieties. The majority of vegetable varieties grown as microgreens are ready for harvest in about 2 weeks, though the brassicas mustard and radish have a faster growth rate and therefore mature faster than beets, carrots, or chard. 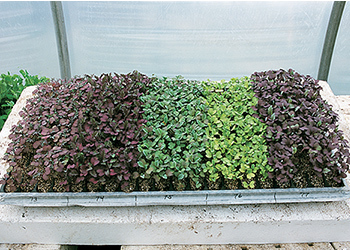 Herbs grown as microgreens tend to be comparatively slow-growing, maturing in 16–25 days. Depending upon types, varieties, and environmental conditions, a production cycle can be prolonged up to 4 weeks and beyond. Use our Microgreens Comparison Chart to become more familiar with the fast-growing and slow-growing groups, along with other distinguishing features, and to help you choose varieties to grow concurrently. With practice, sowing times can be coordinated to produce a mix of varieties, all ready for harvest at once, at optimal size and flavor. To approximate the seed quantities that you will need, you will need to consider seeding density, a relationship we cover in more detail below, under Sowing. Another part of forecasting how much seed you will need involves approximating the quantity of product that you need to harvest to meet your market demand. To help you compare seed quantities to sow versus potential yield during the planning phase, we created a tech sheet detailing the results of our Microgreens Yield Trial (Averages) for 29 Popular Varieties. With some trialing, good record-keeping, and repetition, a grower can become adept at estimating seed requirements versus project yield, timing production cycles, and forecasting ROI. Growing microgreens off-season indoors or in a greenhouse requires additional attention and resources. Before you get set up, calculate how much space you have or will need, and gather together a few supplies — many of which you may already have on hand: a growing medium such as soilless mix, trays, and domed lids. Microgreens are often sown into standard 1020 flats or 20-row seed flats filled with a light, sterile, soilless mix to a depth of 1½–2". To produce high-quality product at optimal turnaround times, you will require a sheltered but adequately warm, ventilated, and lit growing area. Heating mats, lighting, and fans will help provide these favorable environmental conditions. Growing on hanging benches, raised platforms, or tables keeps the plants safe and provides for ergonomics. With their short crop cycles and minimal to no fertility requirements, microgreens are an excellent crop for hydroponic culture. See our Hydroponics Information Guide to learn more about systems and equipment for this production method. 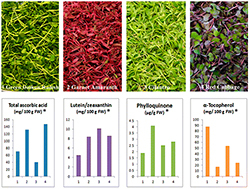 See our Microgreens Tech Sheet for more details on sowing and production. When getting ready to sow, take seed size into account, as this will determine the best method of planting. Sifters and colanders can be used to help to sort seeds by size. Seeding densities should be thick enough to cover the flat, but not to the point of inhibiting air flow. Both small and large seeds should be sown thickly, then gently tamped into the growing medium. As a rule of thumb, sow small seeds at a density of approximately 10–12 seeds per square inch of tray surface, and larger or medium-sized seeds at a density of 6–8 seeds per square inch. Once the flats are sown, small seeds can be covered with a layer of paper towels, or finely sifted vermiculite, or a small amount of soilless mix. Large seeds should be covered with a light layer of the grow mix. Water them gently to avoid washing away the seeds. Then cover the flats with either a clear or white plastic dome to retain humidity and aid in germination. Build a versatile Hanging Microgreens & Seedling Bench for your greenhouse, hoophouse, or high tunnel with our Parts & Construction Cost Calculator and detailed Construction Guide. Ideal soil temperature for germination and growth is dependent on the specific need of each variety, with different considerations for heat-loving crops like basil than for cooler-loving brassicas. Optimal ambient temperatures are also variety-specific, but 65–75°F/18–24C° is generally a favorable range. Temperatures above 75° can increase disease pressure and inhibit germination in some varieties. Sufficient air circulation can be provided with fans to prevent pest and disease issues. The flats of microgreens need to be kept moist but not overly wet. Some growers use bottom-watering methods to minimize soil splashing, which can also help to produce a cleaner finished product. Some growers find that fertilizing is needed to prevent yellowing of the microgreens. A soluble fertilizer in the mister or bottom-feed water supply can resolve this. Producers should take care to prevent any "off-flavors" that can at times derive from fish-based production materials. Many plants respond differently to artificial light than they do to natural light. Take note of light duration, wavelength, and intensity, and distance from the crop, factors that will determine the growth rate and quality of your finished product. If the light source is positioned too far from the crop, stretching or legginess may occur. Crop color may appear washed-out when the light intensity is insufficient. 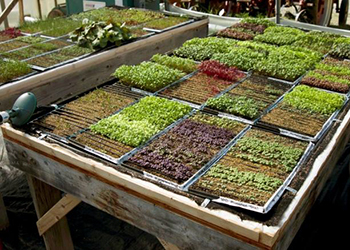 Because of the one-cut nature of microgreens, succession planting is necessary to produce a steady supply of this crop. Sowing dates and quantities of seed sown should be based upon customer demand, delivery schedules, and varietal growth rates. As noted, different varieties grow at different rates. Keep records and modify your system as needed. Harvest & handle with care: this high-value crop has a shelf life that matches its stature. Microgreens are typically harvested at the first-true-leaf stage of growth, with the cotyledons still attached, or at the seed-leaf stage, at heights varying between 1–2". Gauge readiness using number of days listed for each variety along with appearance and taste. To help you plan ahead and and set appropriate expectations, we have published the results of our Microgreens Yield Trial (Averages) for 29 Popular Varieties, as well as images of each of these 29 varieties at harvest size on their individual product description pages. Again, some trialing and note-taking can be helpful in determining optimal harvest period for your situation. 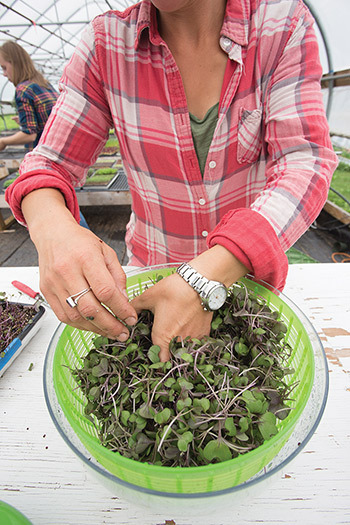 Microgreens are a tender, highly perishable crop, and need to be handled with care. Depending on your production methods and market requirements you may opt to grow and sell it as rooted, living product; or to cut the product directly into its final packaging, such as clear plastic clamshells or totes; or to cut it into a salad spinner for mixing and/or washing. Harvest by cutting handfuls with scissors, or cut entire flats with an electric knife. Packaging can be selected according to the primary end-users in your market, whether sold in an individual-serving size or in bulk, based on weight or volume. With their short shelf life, refrigeration is necessary to maintain post-harvest freshness and quality. Although addressed last in this guide, placing market research at the top of your priorities will benefit your chances of success. Here are a few key strategies. 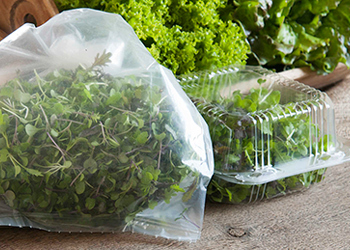 Micros can be brought to market in in micro-perforated food-grade bags, clamshells, or as live product in their growing medium. Before you ramp up production explore your market opportunities and be sure you have a customer base. Contact potential microgreens customers in your projected distribution area — restaurants are the most common channels, but specialty food stores and some farmers' markets may also have demand. Plan to produce a few preliminary mixes, or set up an assortment of individual microgreens samples to offer free of charge, to develop your customer base. This approach can also be effective when introducing a new variety or line of produce to established customers. Give your brand pizzazz with a one-of-kind mix. First, choose a set of candidates with an interesting complement of colors, flavors, and textures. If you select 5–6 varieties with similar growth rates and cultural requirements, you can combine equal or varying ratios of seed before sowing to produce the mix. If you select varieties with different growth rates and/or cultural requirements, you can seed them on separate days, grow them individually, and have them ready for harvest at the same time, blending them together after harvesting. 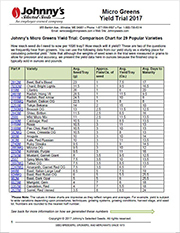 In either case, be sure to keep detailed records of varieties, seeding dates, and the percentages of each component used, so you can easily duplicate a promising custom mix. Finally, if you're not already routinely surveying your buyers and chefs for input and feedback, add that to your checklist, too, so you can modify and improve your product line over time. Customers stay more engaged when offered novel varieties and combinations, especially when confident of the freshness and quality of your product. 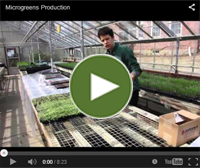 Use this as a set of guidelines to get your microgreens program up and running. For additional information about year-round microgreens production, refer to the resources listed below. Produced efficiently and marketed with a dash of flair, microgreens can elevate your operation to a whole new level.